diaCRITICS editor Viet Thanh Nguyen discusses the significance of “Black April,” or what the South Vietnamese in exile call the anniversary of the Fall of Saigon. This is a reprint from April 2013. Black April is the term that Vietnamese Americans have come up with to name the anniversary of the Fall of Saigon, April 30th, 1975. This is the day when South Vietnam disappeared forever from the maps of the world, if not from the maps of many hearts. 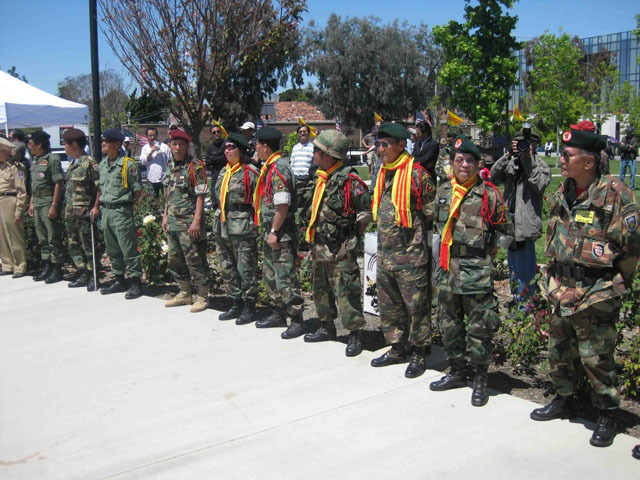 On that anniversary day, if you happen to be in the ethnic enclave of Little Saigon, in the cities of Garden Grove and Westminster, in the County of Orange, in the State of California, in these Altered States of America that are no longer the same because we came, you will see the last remnants of the Republic of Vietnam gather in a dazzling array of military uniforms and ao dai as they mourn their lost country, South Vietnam. 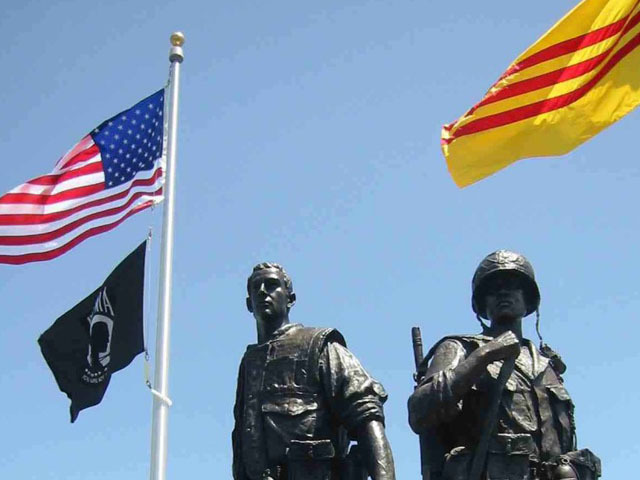 There, on All American Way, these patriots sing their two national anthems, salute their two national flags, and proclaim South Vietnam’s American afterlife in their own Communist Free Zone (also known as the Zone of No Free Speech). Black April stirs mixed feelings in me. On the one hand, it is important for people to have their rituals and ceremonies, which allow them to build communities and pass on traditions, memories, and cultures. If Southern Vietnamese people in exile don’t do this for themselves, who will? The Southern Vietnamese community in exile reminds the Communist government of a history and a people it would rather forget. 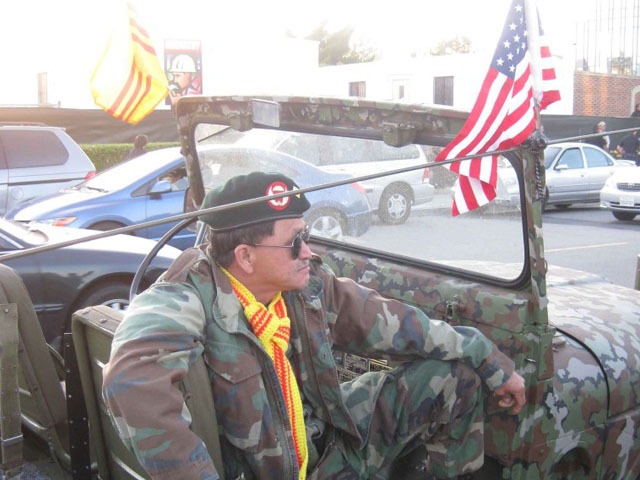 The Southern Vietnamese community also reminds fellow Americans of a history and a people that they would rather forget, or at least remember in ways that are self-serving to American interests. For these reasons, maintaining Southern Vietnamese memory remains a crucial kind of cultural work. On the other hand–do we have to call this anniversary Black? Really, Vietnamese people? Is that the best we can do? After all, isn’t White the color of death in Vietnam? Don’t we, on funeral days, strap around our foreheads a White scarf of mourning? Didn’t we, when we first came to America, think that we had come to a White country? A country of indistinguishable White people who liked White bread, which was a problem because we liked French bread, which, if you think about it, is a problem in and of itself? A country where, in certain states, snowfall would turn the land White in the most evident sign that this country was not like our country, where it never snowed, although that would have been nice if it did, given how hot our country was, which we only discovered on our return many years later? A country that had produced some clever fellow who, in planning for the demise of our country, decided that the song with which to warn fellow Americans in Saigon that they should run for the helicopters was White Christmas? A country where the best thing one might say was that the rice was, at least, White, even if it was instant and made by a Black man called Uncle Ben, until about the 1990s, when all of a sudden large numbers of White people began proclaiming that what they really liked was Brown rice, if not necessarily Brown people? Was this not a country, then, where it would have made sense to use the word White as often as possible, in the hopes that Whiteness would stick to us, as in the expression White on rice? What does that even mean, White on rice? The point is—shouldn’t Black April be White April? But of course Black April will never be White April because one of the first things we learned in coming to this country was that it was not really a White country, or not only a White country. Rub the White off this country and you’ll see: it’s actually non-Black beneath. When we first came to this country, not enough of the White had been rubbed off for us to really see that yet. At first, back then, White people did not know what to make of us. Yellow was a perplexing color, even though some of us were really closer to Brown, and a few of us weren’t far from White. Not that it really mattered, because we were still Gooks to a number of Americans, except for the liberal ones, to whom we were Orientals. Some good White people welcomed us, but most White people did not want Gooks in their backyard. They checked their gates to make sure they were secure, kept a closer eye on their pet dogs in the not-so-mistaken belief that we might mistake them for hot dogs, and protested to newspaper editors and political representatives that they did not want their taxes going to pay for rescuing Gooks whom good American boys had died for, spilling their Red blood in the fight against the Reds. Some Black people undoubtedly felt the same way, which was not surprising, as they were still Americans, which possibly made them feel better when they compared themselves to Gooks. Everybody knows in America that if you’re white, you’re alright. And if you’re black, you better step back. Even if you’re brown, just go around. But if you’re Yellow—Hell no! In this situation, at least the Yellow people already here should welcome us. Thus it was surprising to discover that some of the Yellow people already in America also did not want us, because, ironically, we were not Red. For these Yellow people who had spent the Sixties carrying around Mao’s Little Red Book, it was annoying to discover that the Vietnamese people they had been rooting for—to the chant of Ho Ho Ho Chi Minh, the NLF is going to win—were not the Vietnamese people who showed up on American shores. In any case, the Little Red Book was a book that we knew a good Gook was not supposed to read, and some of us quickly set out to prove that we could read every other book that was put before us. We wanted to be those people at whom not a second look was cast. We soon enough figured out that if we could not be White, we could at least not be Black. This was not a lesson that we learned only on coming to America. Even in our country, we knew the difference between White and Black. Americans had brought everything from America to our country, including segregation and the Blues. In Saigon, Khanh Hoi was for Blacks, who called it Soulsville, and Tu Do was for Whites, who may or may not have known that it meant Freedom. So to name the anniversary of the Fall of Saigon we really did have to use Black April, even though I don’t recall seeing any Black people at a Black April anniversary. Although I have seen many White people at this anniversary, calling it White April would be a dangerous thing. White people would ask, Why are you calling it White? Would we really want to tell them that White is the color of death? Would we really want to point out that the Pentagon is White, and the White House is White, and the Washington Monument is White, and that while White people thought that White meant something pure, like driven snow or Colombian cocaine, some of us didn’t necessarily agree? Did we really want to say that if somebody who had been bombed by White people was suddenly teleported to Washington, DC, that somebody might think that White was really the right color for the Department of Death? Did we really want to have to explain to White people, and really even to ourselves, that even though Black, White, Brown and even a few Red and Yellow soldiers had all taken part in killing us, that it was all White men who made the really important decisions? It was White men who decided to drop more bombs on us than on all of Europe during World War II and it was White men who came up with real estate terms like Free Fire Zones, places where it was open season on Yellow people, and where the only good Gook was a dead Gook. Some of us were so accepting of these White ideas that we would, years later, defend John McCain when he came to the County of Orange and used the word Gook. He didn’t mean us, some of us said. He meant the Communists. So we went on being the good Gooks, and some of us, perhaps vaguely remembering these Free Fire Zones that were reserved for the bad Gooks, came up with things like Communist Free Zones for the good Gooks. This really makes White people laugh at us, because they instinctively understand what it is that many of us do not. Communist Free Zones are those zones where White people don’t have to worry because the Yellow people are too busy hating those other Yellow people who might be Red. In these Communist Free Zones the good Gooks among us can hunt for the bad Gooks, which is preferable, for White people, to having any Gooks at all hunting for them. So much unnecessary noise and energy has been expended by the good Gooks hunting for the bad Gooks, when it’s actually very easy to find the bad Gooks. Just look at your own shadows, Vietnamese people. If we really want to get into the subliminal, if we really want to be exegetical, we should point out that the war fought in our country (and in Laos and Cambodia) was carried out in the name of Domino Theory. Domino Theory is only a Black and White way of seeing the world. Did no one ever come up with the Mah-jong Theory of geopolitics? But even so, that’s Chinese, and while we like Chinese food, we don’t like Chinese people, even though some of us probably have Chinese blood. Now we’re getting too far afield! 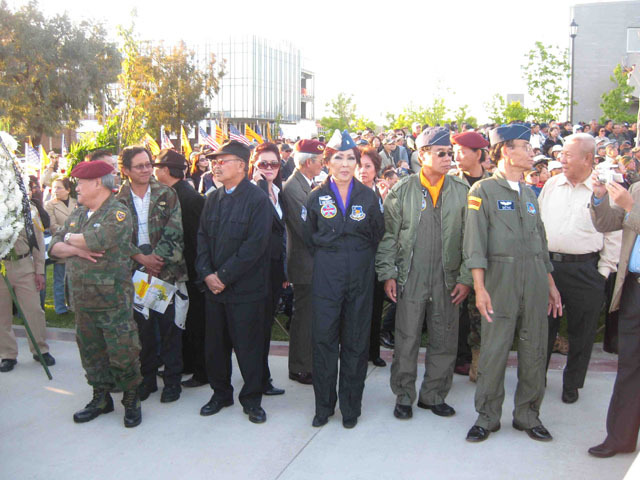 The point is: Why Black April, Vietnamese people? If you think I’m wrong, let’s call it White April, just for once, and see what White people say. Let’s call it White April just to remind ourselves of our own customs of mourning, since some of us are into preserving our culture. Let’s call it White April just to honor the White people who so often surround us and the White culture in which we so often find ourselves. Let’s call it White April just to remind White people that White has more than one shade of meaning and that some of us haven’t forgotten what some White people did. Let’s call it White April just to let Black people know that we’re with them, or, if that’s going too far for some of us, not against them. Let’s call it White April because, in the end, we can call April anything we want. Yes, Vietnamese people, if we have to call April anything—although who’s to say we have to call it anything at all—just for once let’s call it White. Have you subscribed to diaCRITICS yet? Subscribe and win prizes! Read more details. Please take the time to rate this post (above) and share it (below). Ratings for top posts are listed on the sidebar. Sharing (on email, Facebook, etc.) helps spread the word about diaCRITICS. And join the conversation and leave a comment! What are your feelings about the Fall of Saigon or Black April? I enjoyed both the content and style of this piece. The questions it raises and facts it mentions are typically ignored in what, for want of a better phrase right now, can be called mainstream discourse. 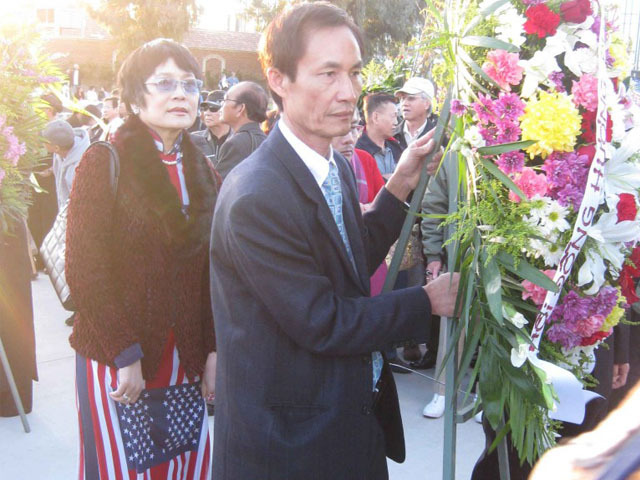 I feel it is important, at least for the younger generation of Vietnamese Americans, to realize that the Black April commemoration should not end up whitewashing very real, huge crimes against humanity, mostly against the yellow people. Maybe some black humour is called for here? The George Carlin quotation is appropriate in both content and style for this post! thanks for sharing it. good point. is it possible that the mourning is for the loved ones who passed away or became separated from each other and not necessarily for (the dead) south vn? such mourning was politically forced to be suppressed for many decades in vn (and many would argue that this is still the case)…. finally, outside of vn, many vietnamese have more freedom to mourn for their loved ones. to mourn is to be human. i agree that mourning is important and that the south vietnamese need to mourn their own. my skepticism about “black april” is that that mourning takes place in political frameworks that reinforce dominant american society in at least two ways: through the “politics of gratitude” towards america that yen le espiritu and phuong nguyen talk about in their scholarship, and its inverse, turning a blind eye toward america’s structural inequalities that vietnamese americans are happy to participate in as people who affirm the american dream. all that gets delivered at black april celebrations too. i wouldn’t say that white is appropriate because, in order to have rebirth (as symbolized by the color white), there must be death. for many overseas vietnamese, their vietnam is still alive and has never died. of course, many of their loved ones may have been killed/are slowly dying (e.g. ptsd) as a result of the fall of saigon. however, in order to be responsible and preserve the memory of these dead lives, overseas vietnamese must keep their vietnam alive. thanks for sharing. it’s true that white is usually worn at funerals to signify death/purity/rebirth. however, during the period of mourning after the funeral (which is up to a year, i think), close family members often wear a black band on their arm or shirt to signify that they’re mourning. thus, i think that the word black in “black april” implies mourning and not death…..after all, for many overseas vietnamese, their vietnam is still alive. this partially explains why many of them still embrace the flag of south vietnam and have demanded many cities to recognize it as their cultural & heritage flag. thanks for the reminder, quyen. Thi Bui: "Many of us don’t bother to vote while others cannot vote because laws and bureaucracies have been created to suppress their vote. This is a shaky democracy. But the stakes are so high that we must each do this small thing - show up to the polls, drop off that mail-in ballot, vote as an exercise of the democracy that, while imperfect, still exists." diaCRITICS editor Viet Thanh Nguyen writes on the rigidity of defined borders and recognizing the importance of immigrants in America's history: "I am an immigrant. I am also a human being, an American, a Vietnamese, an Asian and a refugee. I do not have to choose among these identities, despite those who would insist that I do."